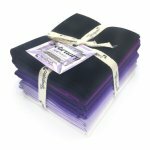 This special selection of solid fat quarters gives you the palette of rich colors needed to make the MJ Kinman's February Birthstone Pattern shine! Royal purples and contrasting highlights to make a stunning Amethyst gem. 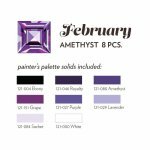 This fat quarter pack satisfies the fabric requirements for 'The Birthstone Series: February - Amethyst' fat quarter pack, by MJ Kinman for Paintbrush Studio. Pack includes 8 fat quarters.